The next marquee Windows 10 update won’t be just about creators – it will also blow artificial intelligence (AI) wide open on the operating system (OS). The company made the interesting announcement during its Windows Developer Day event on March 7. Essentially, Microsoft plans to bring the underlying machine learning or AI tech behind its Cortana digital assistant, Windows Hello, smart Bing search and more to all Windows 10 app developers. This will enable Windows 10 ‘to deliver more powerful and engaging experiences’ through AI, Kam VedBrat, Group Program Manager on the Windows AI Team writes. Microsoft is simply calling this ‘the AI platform in Windows 10,’ and promises low latency and real-time results by leveraging a given computer’s processing power, even name-dropping video game engines as a possible use case for the technology. Furthermore, every type of device that supports Windows 10 – short of phones – will support this platform. So, it seems as if Microsoft is intent on competing with projects like Google’s own Tensor processors built specifically for AI applications by providing the underlying code for other processor designers and manufacturers. 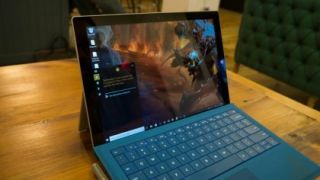 For readers like you, expect to see your Windows 10 devices inch ever closer to that Her-like capability – but hopefully not that disposition – in 2018 and beyond. Whether you like it or not, AI is about to become a much more expansive and ubiquitous part of your digital life.